Another Novichok poisoning in Salisbury - 2 hospitalised. 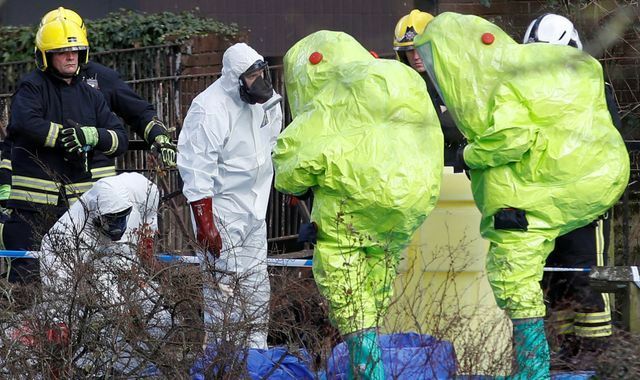 Police wearing protective suits entered a hostel in the southern English city of Salisbury on Friday as counter-terrorism detectives stepped up their investigation into how two people were exposed to the nerve agent Novichok. A team of 100 officers are working to discover how and where a 44-year-old woman and a 45-year-old man, both now critically ill, came across an item contaminated with Novichok, the same toxin used in an attack on ex-Russian spy Sergei Skripal and his daughter four months ago, Reuters has reported. Britain has accused Russia of poisoning the Skripals with the nerve agent - developed by the Soviet military during the Cold War - at the former spy’s home in Salisbury in what was the first known offensive use of such a chemical weapon on European soil since World War Two. “Meticulous and systematic searches are under way at a number of sites. The safety of the public and our officers remains paramount and the searches will take longer because of the precautions that we must take to ensure there is no outstanding risk,” police said on Thursday. Skripal - a former colonel in Russian military intelligence who betrayed dozens of agents to Britain’s MI6 foreign spy service - and his daughter Yulia were found slumped unconscious on a park bench. They spent weeks in hospital before being discharged.